Some jobs are just too good to be true. 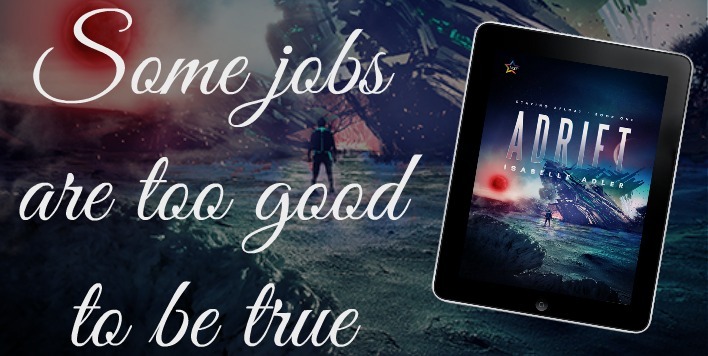 Captain Matt Spears learns this the hard way after a mysterious employer hires his ship to hunt down an ancient alien artifact but insists on providing his own pilot. Ryce Faine is handsome and smart, but Matt has rarely met anyone more obnoxious. With tensions running high, it isn’t until they are attacked by the hostile Alraki that Matt grudgingly begins to respect Ryce’s superior skills, respect that transforms into a tentative attraction. Little did he know that their biggest challenge would be reaching their destination, an abandoned alien base located on a distant moon amid a dense asteroid field. But when Matt learns that Ryce isn’t completely who he says he is and the artifact is more than he bargained for, he is faced with a difficult choice. One that might change the balance of forces in the known galaxy. Matt doesn’t take well to moral dilemmas; he prefers the easy way out. But that might not be possible anymore, when his past comes back to haunt him at the worst possible moment. When faced with a notorious pirate carrying a personal grudge, the fragile connection Matt has formed with Ryce might be the only thing that he can count on to save them both. The low hum of music and the loud voices threatened to swallow his response. The Blue Giant was like any other canteen on any other small-time maintenance space station, offering cheap drinks and free talk, catering to drifters, smugglers, freelance pilots, and the dregs of every known society. The strong smell of synthetic spirits enveloped the crowded room in an almost tangible cloud. It really wasn’t the best location for conducting business, even over interstellar communications channels, but one could stand being cooped up in a spaceship for only so long. Matt ignored the noise best he could as he squinted at the commlink screen. This wasn’t a regular type of job, but then again, freelancers didn’t exactly have regular jobs. As it was, this one promised to be very well paying. His potential client had introduced himself as Mr. Ari, though Matt suspected it wasn’t his real name. They usually weren’t. At the moment, he was more concerned with Mr. Ari’s terms and conditions than with his identity, fake or otherwise. “It’s my ship and I’m the only one flying her,” Matt said indignantly. “No way I’ll just let some stranger take over. Now, a passenger, that’s another matter. I’ve nothing against passengers, so long as they’re nice and quiet.” And good-looking, but he wasn’t about to say that to the client’s face, or to the lack thereof, as the case was. But another pilot? This was ridiculous. If the only thing this guy needed was a ship, there were much simpler alternatives than hiring Matt’s services. “Name your price,” Ari said tersely. “One hundred thousand,” Matt said, testing the waters. “Of course,” Matt said. Really, this was tedious. Every client thought they were the only one in the galaxy who had dirty secrets. He wouldn’t have been in this line of work for as long as he had if he couldn’t keep his mouth shut and his eyes averted. Now he wanted him to report to the guy? Matt was utterly and completely done with reporting to anybody for the rest of his life. He was more than capable of handling any situation, and he wasn’t about to play the chain-of-command game with his client’s representative. However, he kept it prudently to himself. You didn’t sass somebody who was willing to shell out all those credits. “My pleasure,” Matt said. He disconnected the call and sagged back into his chair, pushing away the beer. He had a very, very bad feeling.